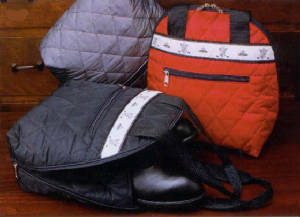 -Quilted nylon bags with ribbon accents for on-course and off-course golf style. -Each is vinyl-lined for durability and easy cleaning. -Measures 12" x 11" x 5"
Please specify color and product ID when purchasing. 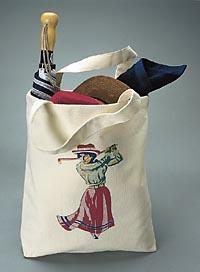 DESCRIPTION The perfect bag for errands, marketing and toting accessories to the course. Choose from two brightly colored golf images to adorn the front. Each is made from cotton canvas and measures 16" x 4-1/2" x 14-1/2". 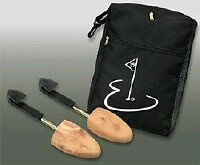 DESCRIPTION Black Nylon ditty bag with 19th hole logo. Clips to golf bag. Measured 6" x 7" with zip closure. Accessories not included. 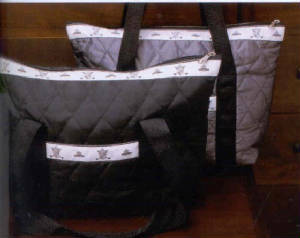 Handsome shoe tote made of Cordura® nylon with 19th hole logo. Mesh side panel allows air in so shoes can breathe full-length back zip allows easy access. 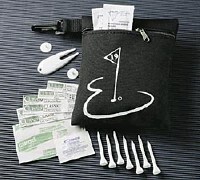 Zippered front pocket and clip handle. Measures 9" x 12" x 4-1/2". Large enough for shoes plus other accessories. -Measures 17" x 6" x 3"